Moscow Diary is the diary kept by Marjorie Farquharson during the period in which she established Amnesty International’s Information Office in Moscow, a unique venture during a fascinating period of change. In 1991, Marjorie was the first westerner working on human rights with a permanent base. It was particularly important because for years the USSR had considered Amnesty an anti-Soviet organisation – “a nest of spies” so to speak. 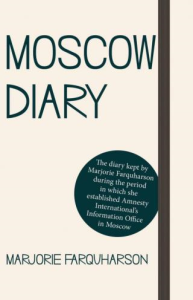 Marjorie’s role together with her penetrating perceptions and her entertaining style of writing make this a very interesting account which combines insights into the politics of human rights and into the unusually wide range of people Marjorie encountered. Most westerners in Moscow lived a life apart with access to foreign currency shops and good-quality food. Marjorie chose instead to live as an ordinary Muscovite, in one room with a small kitchen, even when, in 1992, the inflation rate in Russia soared to more than 2000%. 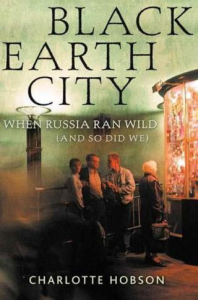 The fact that the diary was written 25 years ago doesn’t in any way undermine the author’s efforts to help Russia become “a normal country”, nor does it hide the author’s true passion for the Russian people. A gem of a book capturing a moment in time by a truly humble, self-sacrificing woman.